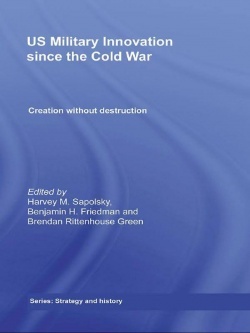 This book explains how the US military reacted to the 'Revolution in Military Affairs' (RMA), and failed to innovate its organization or doctrine to match the technological breakthroughs it brought about. Many called for the transformation of the US military in the years after the end of the Cold War, seeking the changes in organization and doctrine that would complete the RMA innovation and a commitment to counter-insurgency, peace keeping and nation building missions. This volume describes the origins, uses, and limits of the RMA technologies, examines how each of the five US armed services (categorising the Special Operations as a separate service) made their adjustments both to the technologies and the use of force, and how the role of the civilian officials and the defense industry altered in this process of change and avoidance of change. The book examines the internal politics of the services as well as civil/military relations to identify the external pressures on the services for significant change in their doctrine and weapons. Many have noted the failure of the services to innovate in what can be called the 'Second Inter-war Period' (the years after the Cold War). This book offers explanations for this failure and arguments about the possible range and desirability of military innovation in the post-Cold war era. This book will be of great interest to students of strategic studies, US defence politics, military studies, and US politics.